No, I’m not talking about mics and speakers, I’m talking about creating change in the systemic way we have done things in Arts, but more specifically, in opera. We are finally starting to see some traction in theatre, maybe a bit in film and television in terms of equitable hiring practices, casting, diversity, inclusion and better practices concerning anti-racism and anti-oppression. It’s about time we see this in opera. AMPLIFIED OPERA is a joint collaboration between director Aria Umezawa (she/her), and opera singer and theatre creator Teiya Kasahara (they/them). The collective began out of concern over the ways in which marginalized people have been continually under- represented in opera. Both Umezawa and Kasahara were separately disheartened that opera’s sister disciplines, film/tv and theatre, had made much more strides in ensuring spaces for the representations of diversity in all forms. Umezawa and Kasahara decided to come together and take action. Since the summer of 2017 Umezawa and Kasahara have been exploring how a collective, and soon thereafter, a new type of performing arts company could encompass a revolutionary and new artistic mandate while still producing opera, theatre, and music, in exciting, relevant, and provocative ways. They firmly believe opera, too, cannot only be progressive and inclusive, but that it can exact social change. Their inspiration comes from works and practices across the performing arts that have succeeded in creating equitable and talent driven spaces. Given the past year’s societal drive to demand artistic projects that speak to the realities of the political moment in which we find ourselves — one that is working to overcome racist, sexist, homophobic and transphobic ideologies — the time is right for Amplified Opera to officially debut as a collective. AMPLIFIED OPERA’s first production is Teiya Kasahara’s The Queen in Me . It is a timely work of theatre that resonates and reflects the core values, mission, goals and objectives of the collective itself. Last season Kasahara discovered her love of theatre while being a part of the Emerging Creators Unit at Buddies in Bad Times Theatre. 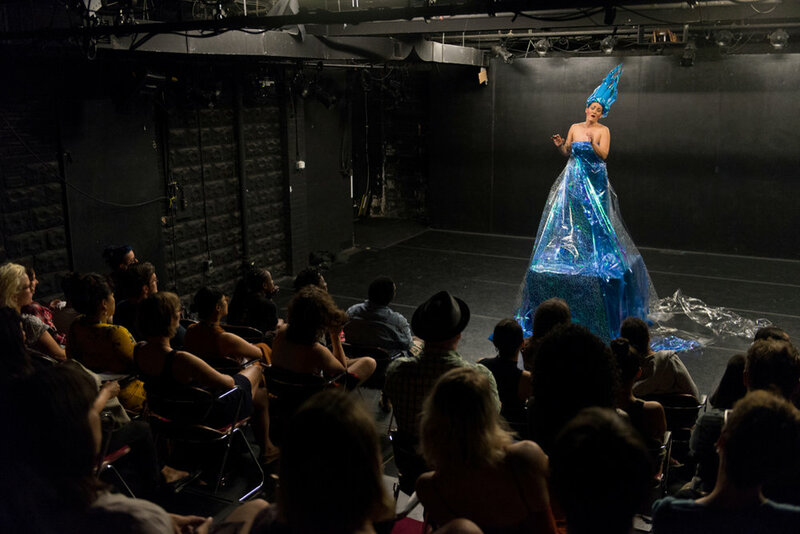 Kasahara created and performed a one-person show entitled The Queen in Me , directed by Andrea Donaldson. The work set off a fire inside of her; theatre enabled her to express fully and honestly her struggles as a Japanese-Canadian, queer, butch, gender non-conforming soprano in an opera industry that is known for its overtly heteronormative, racially insensitive, and misogynist storylines. The Queen in Me was tremendously well received, especially by her trusted colleagues from opera, including Aria Umezawa. It inspired both Kasahara and Umezawa to want to produce these types of artistic works, ones that exemplify truth, rebellion, and awe, and that give artists from marginalized groups the space in which to do it. SummerWorks 2018. Photo by Henry Chan. In October 2019, the company will debut its AMPLIFIED OPERA CONCERT SERIES with a performance by American mezzo-soprano and author Laurie Rubin (she/her) and British-Canadian pianist Liz Upchurch (she/her). The series will seek to provide a platform for individuals to tell their stories on their own terms through the operatic/vocal repertoire. Rubin, who is blind, has performed at venues such as Carnegie Hall, and is passionate about sharing her experience living without sight.